Bang! And the [insert joke here] is gone! Major label EMI has hired Elio Leoni-Sceti, formerly of cleaning product makers Reckitt Benckiser, as its new head of recorded music. Leoni-Sceti will head up EMI's record label business - despite having no music industry experience whatsoever. A marketing man through-and-through, Leoni-Scenti's tenancy as executive vice president of Reckitt Benckiser saw him oversee product lines such as Dettol, Nurofen, Lemsip, and, ahem, infamous kitchen cleaner (watch this video and you'll see why) Cillit Bang. EMI, like most record labels, has been having a tough time in recent years, thanks in no small part to irritating music pirates (read most music consumers) and their growing distaste for actually paying for recorded music. The decision to appoint a marketeer rather than a music man is perhaps evidence that EMI boss Guy Hands is opting for a slightly radical, commercial approach to tackling the piracy problem. Leoni-Sceti himself has said he won't have any part in the Artist and Repertoire side of the business - he'll leave that to new A&R boss Nick Gatfield - and instead will attack his new role from a brand-rather-than-band management perspective. "What the music industry needs is an [understanding] of how to build branding around artists," commented Leoni-Sceti, and perhaps he's right. Perhaps. 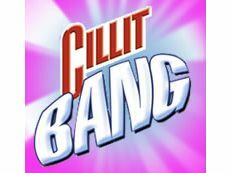 Here at MusicRadar, though, we're more concerned with trying to think up Cillit Bang-related puns.